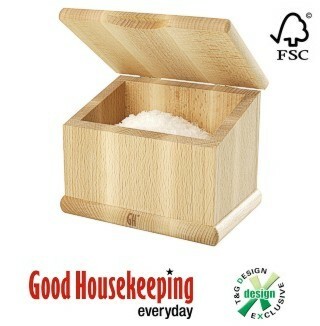 This high quality salt box is made from FSC oiled beech. It has a hinged lid and includes a scoop. Designed for constant use in the kitchen environment and to protect and keep the salt or spices free running, the beechwood will give many years of trouble-free service. It is 14 by 11 by 11 cm (5 1/2 by 4 1/4 by 4 1/4 inches approx). All Good Housekeeping ® wood products are guaranteed for 3 years.